If you find using manual grass shears too tiring or if you have a really large lawn, garden or yard, you need the best cordless grass shears. These battery-operated miniature electric lawn clippers will help you shear, edge, top or trim your grass in no time. Widely available from various well-established and trusted manufacturers of gardening tools, cordless grass shears will differ in terms of battery capacity, the blade engineering and quality, the ergonomics and the versatility. Not to overstate the obvious, you do need a great capacity battery for longer run time. The capacity varies from 1300mAh to 3000mAh or even a tad more. The average use will also have an effect on how long your charge will last. As for the battery chemistry, Li-Cad and Li-Ion are the most common types. If your grass is thicker or denser, or if you’re trimming a shrub or two, the battery will last shorter between charging as you will be using more power from your cordless grass shear. For more demanding lawn jobs, consider the best self propelled lawn mowers. If you go for larger battery capacity, the charging time will increase from 30mins all the way up to 6 hours. The higher capacity does come at a higher price but this is outweighed by the advantages of being able to work longer with no forced stops. You can charge the highest capacity batteries overnight and that’s far better than going for a cheap low-capacity model which will need more frequent charging and may force you to stop shearing before the whole work is done. You should still have the best grass shears for manual use at hand, just in case. Battery chargers are usually included and extras can be purchased if you lose or damage the original. You can also buy batteries to replace the original when its life cycle has been reached. Bear in mind that some cordless grass shears are sold as “tool only”, which means that you need to buy the battery separately. It will be a little more expensive but the advantage is that you can go for the highest capacity battery which fits that particular model of cordless electric lawn clippers. Cordless grass shears are much more convenient for topping and trimming jobs. Due to the position of the blades, edging may be difficult at times. The blade length varies from 4-14 inches on average. Due to the way, it’s designed, the blade can’t be easily sharpened like your handheld pair of shears. This is why the quality of the blades, as well as sharpness, is very important from day one. Some units come with multiple types of blades for different jobs. The best models offer convenient switching of the blades without any tools. The blades are made of stainless steel or carbon steel and some come with a protective coating like the models which have nickel-plated blades to protect them from corrosion, staining and sticking. Some units come with a toboggan addition which helps to adjust the exact height at which you want to top your grass. Needless to say, cordless battery operated grass shears will be far less strenuous to use than manual models. However, you will still have to hold them for a certain amount of time so the quality of the handle is not to be overlooked. The materials and features of the handle vary but most handles are made to be comfortable to hold even for longer jobs. They also have useful features such as a safety lock. In addition, go for the electric lawn clippers with rubberized handles as these will provide even more comfort and superior grip while topping or trimming. They will also soften the vibration effect of the tool. Some units even come with long, telescopic handles to make the shearing easy on your back. A few models come with wheels but the practicality of those depends on your terrain and personal preferences when it comes to handling battery operated shears. Gardena 8885-U 3-Inch Cordless Lithium Ion Grass Shears, Classic Cut edition will allow you to conveniently cut your lawn edges, with no cables and no hand strain. It comes with a 3-inch blade which makes these shears suitable for topping and edging grass but also for shaping boxwood. This unit also comes with replaceable blades so that you can trim your shrubs, too. Thanks to the light-weight but sturdy and ergonomic handle, the Gardena 8885-U 3-Inch Cordless Grass Shears feels great in the hand and provides powerful performance with excellent cutting results. The replaceable quality blades are precision-ground and non-stick coated. The blades can be changed without tools, which is especially convenient if you’re in the middle of work. The replacement is easy, quick and safe. This way, the grass shears can be quickly turned into shrub shears. This model comes with a battery charger and a blade protection for safe storage. For comfortable cutting of lawn edges without bending over, a telescopic handle can also be added to the shears but we’ll cover that model later. With the Gardena 8885-U, the lithium ion battery adds to the overall light weight and portability as lithium ion batteries are typically very light weight in their design. The lithium ion battery also comes with no memory effects so you can stock up your battery inside the tool without the battery draining in its charge. You can also charge the lithium ion battery for a shorter period of time and use it for a longer period of time. You can use this unit for up to 45 minutes of average operating time and you can just charge it overnight. It takes about 6 hours for a full charge with this lithium ion battery. There’s no guesswork when it comes to the charge level because there is an LED display that tells you when the battery is currently charging or fully charged. A few more words about the blade. It’s made from a high-quality material that will last for a very long time. The blades are designed to give you a classic cut with these powerful and portable cordless grass shears. Although the blades measure 3 inches in length, you can replace the shear blades using the shrub shears measure 5 inches in length. Cutting power is awesome, rechargeable batteries are good capacity and lightweight, the blades are sharp and well-made and you even get a blade protection with this cordless grass shears from Gardena. Super light weight at only less than 2 pounds allows for long but easy topping and edging lawns. In addition, you can also taking care of your boxwood plants as the handle is very ergonomic. At this price, with such good performance and with a 2-year warranty, Gardena 8885-U Cordless Classic Cut Grass Shears is a great buy! VonHaus 2 in 1 Cordless Grass Shears Hedge Trimmer comes with the grass shears for topping grass or edging shrubs around the home plus the hedge trimmer for a wide variety of trimming jobs. And that’s not all; you will also get a handle which is telescoping in its design. You can easily extend it from 20 inches up to 34 inches in length. The handle will come super-convenient if you suffer from bad back, arthritis, joint pains or if you simply need to access hard to reach areas. The blades are interchangeable so you can choose the one which is needed for the job on hand. At 4 inches in length, the grass shear blade is very sturdy and very effective in cutting and trimming anything in your garden. The blade for hedge trimming which is also included in the purchase measures 7 inches in its length and is ideal for all light trimming jobs. You can’t expect the power of a gas trimmer but you’ll be able to do the most trimming in your garden. The battery used for this cordless grass shear is a lithium ion battery of 7.2 volts. It offers 50 minutes average runtime and can be recharged faster than most batteries. In addition to the fact that it has no memory effect, it will last for a longer time, overall. Lastly, when you buy VonHaus 2 in 1 Cordless Grass Shears Hedge Trimmer, you also get the trolley wheel attachment alongside the handle. Depending on your terrain, the wheels may make the topping jobs even more convenient. This unit is guaranteed to hold an entire charge up to four times more than regular tool batteries. It’s versatile so you can also use around garden walls as well as planters and flower beds in your lawn, patio or yard. The price is really affordable as well. Sun Joe 7.2-Volt Lithium-Ion Cordless Grass Shear/Hedge Trimmer is ideal for gardening and landscaping post-mowing touch ups in tight spaces. It’s powered by is the 1.5Ah, 7.2-volt long-life lithium-ion battery for hassle-free, cordless operation. This unit powers up instantly with the convenient push of a button and starts shearing or trimming, depending on your needs. Rechargeable battery power makes this cordless shear from Sun Joe easy and effortless to use and maintenance-free. In addition, you can top, edge or trim without having to worry about gas, oil, expensive seasonal tune-ups, or toxic hydrocarbon emissions and no hand strain as with manual models. It comes completely assembled with the grass shear blade pre-installed. Both interchangeable blades are designed for easy DIY grooming projects around your garden. 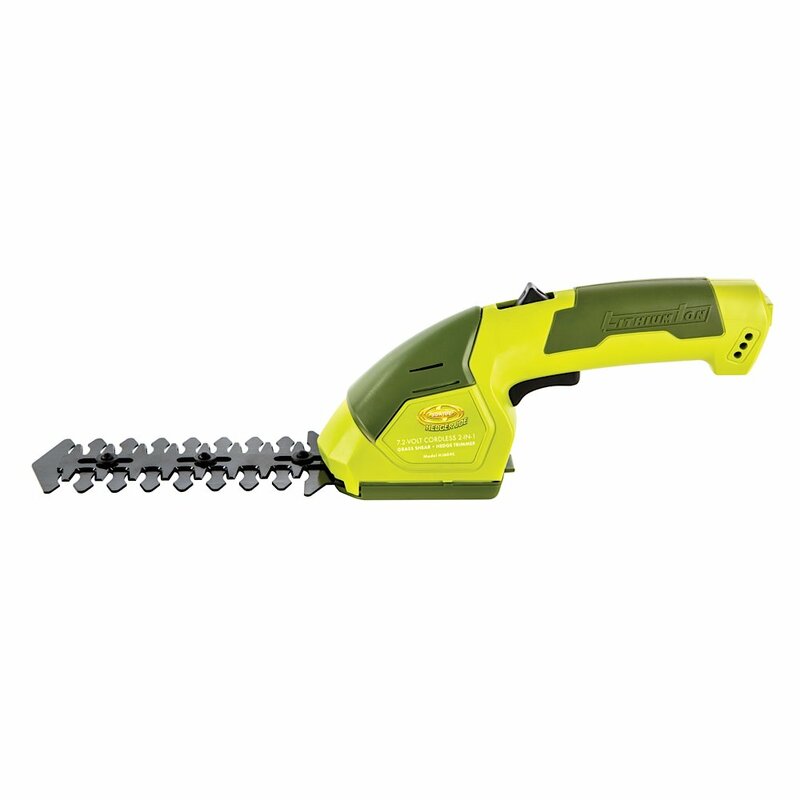 You can use the included additional hedge trimmer blade to cut hedges and shrubs. The grass shear blade is used to cut grass as well as hedges when finer and more detailed cutting is needed. Combining two tools into one versatile device, Sun Joe 7.2V model features an interchangeable blade system which easily converts from a grass shear to a hedge trimmer. Both the 4-inch grass shear blade and the 6-inch hedge trimmer blade are made of durable steel for long-lasting and reliable performance. At only 2.5 pounds, Sun Joe 7.2V unit is easy to handle and control. This means that you can perform a variety of grooming tasks with more comfort and less strain. It also features a safety switch to prevent accidental starting. Switching the blades is super easy. You simply need to turn your Sunny Joe 7.2V shear+ hedge trimmer upside down and gently lift the tab of the blade cover, slide the tab back until it can be removed by lifting the end tip of the blade off of the unit. Once you switch the blade and align the gear shaft in the middle of the blade with the gear in the middle of the unit, put back the blade cover and slide it in so that it clicks into place and you're good to go. ETL approved and backed by a full two-year warranty, the Sun Joe HJ604C 2-in-1 cordless grass shear hedger is certainly a solid unit to consider if you're looking for a powerful cordless grass shear which won't break the bank. Makita XMU02Z 18V LXT Cordless Grass Shears feature excellent durability due to the sturdy and powerful build, as well as the great design of the housing. The cordless design of this electric grass shear makes it portability and sophisticated at the same time. As for the performance, this is a very efficient unit for gardening and lawn care. The ergonomic handle prevents user fatigue during the long hours of landscaping or gardening. The compact design adds to a low profile feel when using the shears and also makes it leave a super-small footprint in your shed when not in use. The grass shear measures 13 7/8 inches in its length so it is just right for battery powered grass shears. The dual blade action feature and the motor which runs at 1,250 SPM (strokes per minute) will provide you with the much-needed grass shearing power. This is, however, a tool-only unit, so you will have to buy the battery separately. The battery that fits into Makita XMU02Z 18V LXT Cordless Grass Shears is a lithium ion battery at 18 volts and has the capacity of 3.0 Ah. It can be charged to last up to 2 hours of regular usage. The shears have a warning feature that tells you when the battery is out or running low on the power. The built-in indicator light will let you know when it is time to charge the batteries so you’re not stuck in the middle of shearing with any work left undone. A nice perk is the toboggan-style addition to help you easily adjust the grass topping height when needed to do the perfect landscaping work around and in your garden or lawn. Another cool extra is the lock feature on the left and the right side of the shears handle for added safety. It will efficiently prevent unwanted start up. And, there’s more: the soft rubberized coating adds an ergonomic grip and helps to prevent vibration from the tool. Lastly, the tool-less blade changing system will save you the time and hassle while the nickel plated blades will help prevent corrosion and staining. Overall, a great quality cordless shears unit from Makita, a familiar brand in the gardening and power tool industry. 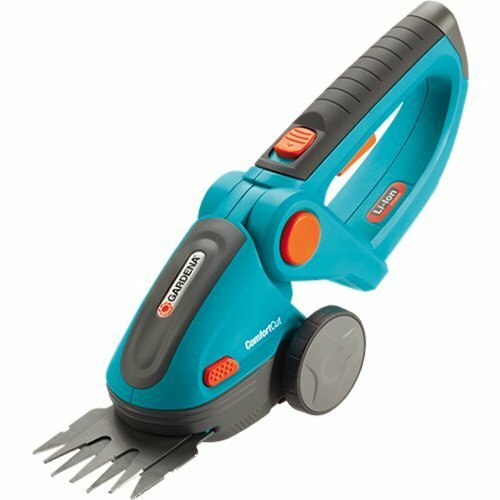 This model meets the needs of all keen gardeners and comes with a 3-year warranty as a token of Makita’s confidence in the quality of their products. Gardena 8893-U Comfort Shears are the single most powerful grass shearing as well as trimming tool from Gardena. It also offers the longest running time of 90 minutes thanks to the high battery capacity. That’s why Gardena 8893-U is more expensive than other models but it’s worth the price, at least according to our team as well as hundreds of happy users. The grip is extremely comfy to hold onto and the operation is very easy. Just turn on the power and a light squeeze will activate the trigger so you’ll be topping, edging or trimming instantly. The replaceable saw-blade edged blades will chew right through whatever you need to trim except for the thickest branches. For those, a much more powerful (and more expensive) specialized power tool is a must have. A battery-level light will turn green, indicating that the battery is fully charged and operational, yellow if the battery is low, and red if the battery needs immediate recharging which takes about 6 hours but provides the 90min runtime, as advertized. Although not included, there’s an optional extension handle available which will ensure you don’t have to bend down to do the job. Anyone who’s suffering from bad knees or back problems will love the ease of use. With a simple exchange of the blade, the Gardena Comfort Shears can be quickly converted to Shrub Shears – convenient and without tools. Thanks to the ergonomic handle with soft plastic components, the grass shears lie perfectly in the hand so you will do the gardening or landscaping jobs with next to no strain. For even more comfort, the handle can be angled and adjusted to the natural hand position, while the wheels allow easy guidance on your grass or sidewalk edges. These qualities make these shears one of the top choices for the best grass shears in the cordless category. Counting in the fact that it features the replaceable, high-quality blades which are precision-ground and non-stick coated as well as great ergonomics and battery capacity, this is a great choice if there are no budget constraints.